"Rikki, don't lose that number,"
"You don't wanna call nobody else,"
"Send it off in a letter to yourself." I got swatted, recently, but good. And, it sort of was like kind of not even my fault. I mean, the whole incident was due to one salient piece of information you won't find in the "Lonely Stellar" Visitor's Guide to Chakona. You can't get a cab in New New York City. You can't get a cab at the Convention Centre, you can't get a cab at Aquila Interstellar Aeroport, you can't even get a cab at the famous Forester's Chakat Delicatessen. There just doesn't ever seem to be one available. You can't get a cab unless you don't want one. These thoughts were going through my head as I was complaining to myself about our long overdue taxi back to the Oceanline Beach Aquila Hotel. It had not yet appeared for us outside of the Turner Coliseum where a big welcome had been held for the assorted top brass of the Federation, who were visiting to congratulate each other about how they successfully formed the new Senate for Chakonan Affairs, and anticipated a big kick-off for The Project. Two morphs and two humans had been selected thus far to conduct this grand undertaking. What we needed all these extra human tycoons and off-world politicians for was beyond me. Let me define, real quick, the half dozen basic steps to a project that has so many managers. Praise and Honours for the Non-Participants. After enduring this evening, I swear, we had gone straight to Step 6. Not only that, I had to trade my uniform work khakis for the absolute worst fitting tuxedo I'd ever had the misfortune of stepping into. As I stood there, staring out into a still-empty car port, hands in pants pockets big enough to use for space plane drogue parachutes, someone crept up silently behind me on a stealthy set of feline paws and placed a svelte hand on my left shoulder. I wasn't ready for it. I jumped. That someone behind me giggled loudly. "Snowdrifter, please don't do that," I pleaded shakily, recognising hir instantly just from the white satin glove of a supple right hand shi'd used, disturbing my Calvin Coolidge collar with hir fingertips. "I couldn't help it," the sweet-voiced, pure white chakat admitted, still chuckling, hir long, blonde hair shaking in ripples down over hir bare shoulders. Shi was in female phase, wearing a fabulous silvery-white evening gown, the plunging neckline displaying a rather dangerous amount of cleavage, although I don't know what for, as this chakat was positively stunning wearing nothing fancy at all. "You look a little silly," Snowy concluded. "Been waiting long?" "Hey, sister, at least you've got something sublime to wear," I pointed out, although shi also had the body to go with it, which I most certainly did not. "I ended up having to rent this thing that makes me look like Batman's worst enemy. And, yes, we have been waiting for a cab that's only about damn near an hour overdue." Most taxis on Chakona are vehicles called PTVs. That stands for Personal Transport Vehicle, and refers specifically to vehicles that are designed primarily for transporting people. This can be anything up to a mini-bus size vehicle, and not just small passenger cars that most privately owned PTVs are. New New York PTV taxis run only on electricity, which is provided by a highly efficient rechargeable battery system. Only zero emissions vehicles are allowed on Chakona, and strict noise pollution laws in many residential communities dictate that only electric cars can access all areas. Plus, the taxis are species specific. For example, taur models have low pads instead of seats, and fold-away backrests with larger safety harnesses. Other taxis provide raised seating and other adaptations for very small species of morphs. They even have ones built for us humans, especially in New New York City, where most of the minority human population on Chakona seems to have ended up. Just about every PTV built has an optional, multiple-redundant AI system which provides occupant assistance, integral collision avoidance, automatic wet weather and rough terrain compensation, even drives the car if you want it to, and like that. However, Public PTV (PPT) systems are used almost exclusively here, downtown in the big cities. These "Peetees" are analogous to taxis, except that they come in all sizes from two-person to mini-bus, and they are completely controlled by the AI. A PPT account allows the commuter to call for a public PTV at any time or place. It's supposed to arrive very promptly as a complex coordinating computer has an optimum number of units available in all areas at all times. The journey is charged to the customer's account and that is the only expense involved. This time around, a secondary expense appeared to be our spare time spent waiting. There just weren't enough taxis in a boom town like New New York City to meet the demand, especially with hordes of off-worlders here on visas. They should have brought their own electric cabs. "Your wife and Silvertip are waiting upstairs with the rest of the entourage," shi told me forming a fist with that graceful right hand and indicating straight above us with an upraised thumb. "You want us to call for an airport bus?" 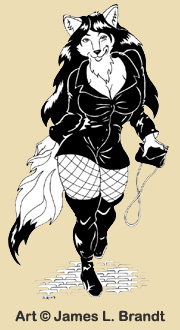 "No, no, what's coming is a two-place human taxi, probably on AI, and that means you'll have to call for taur transportation, anyway," I explained. "I'd rather we went with you, but with our luck, the damn human cab would probably arrive just after we left, and my card would then be charged for a no-show." "Even when it's an hour late?" Snowy wondered. "This is New New York," I grumbled, both hands still stuffed into my oversized pants pockets as I glared out into a still empty street. "It's run largely by what unfortunately is the highest concentration of my kind on your planet. What do you think?" "I suppose you're right," the pretty white chakat said and sighed helplessly, flattening hir ears as shi did so. Shi would know. Shi had lived in New New York all of hir life. "I hate it," I concluded, "when I'm right." "Well, I'll go back upstairs and tell everyone else," Snowdrifter said, turning hir slinky body around to walk away while patting me on the back with the tip of hir long, sinewy, active tail. I simply nodded in reply. "If you really want to make yourself useful, while you're waiting,	you might want to toss out the trash from our hospitality table, back there in the ballroom behind you," shi added. "Why is that?" I asked hir as shi departed. "Won't the janitorial staff take care of that?" "Some of that paperwork," Snowy said smoothly, "is classified." "Yikes!" I exclaimed, and headed for the ballroom. So, I collected up everything that I didn't need. It wasn't much. Just a couple of boxes of unclaimed brochures that the high-powered executive types wanted handed out to distinguished attendees who obviously didn't need them. There was not much really sensitive information on them, but Snowy was right  We really ought to have shredded it, anyway. Perhaps the top secret pages should've been stamped: "CONFIDENTIAL  DESTROY BEFORE READING", or something. I gathered the paperwork together, all of the while watching out the tall, floor-length picture windows of the lobby for our missing taxi. As I strolled outside to the document-destroyer bin, out back of the building next to the trash hoppers, I turned the corner and noticed amber vehicle lights still waiting at a curb about half a block away. I noticed the vehicle parked there before, when I had walked outside a while ago to check the street, wondering about our ride after we had been waiting for half an hour. I thought it was a pizza delivery, or something similar, but this time, I saw that the wide, white, lit-up sign atop the long, light grey PTV definitely said "TAXI." "Geez, what if that's our cab and the dumb AI robot got sent to the wrong address, waiting for us all this while, outside of the wrong building?" I wondered aloud to myself, as no one else was around me at that moment. I decided I'd better get over there and take a look. I tossed out our trash, closed the lid, and walked off, satisfied that I heard a barely audible gnashing noise, indicating that our discarded paperwork had been reduced to recyclable linguini. As I got closer to it, I could see it was a conventional mini-van style PTV parked at the curb with its motor humming away patiently. Electric vehicles did this often while they were waiting. It could actually take more battery energy to restart a stopped motor than to allow it to free wheel in neutral, like an electric fan whirling away on a hot summer night, while the unit was idle. The evening was dark enough, even with the bright street lights, that I could not determine if anyone was inside. All of the vehicle glass looked glossy black, reflecting the darkness, and one or two nearby overhead street lights, like spots on a giant beetle. As I approached the parked PTV, I walked up to what would be the driver’s side door on a standard vehicle. Almost simultaneously with my arrival came an electric buzz, and the driver's window slid open. A rather familiar, grizzly grey muzzle, led by coal-black nose and a broom like tangle of whiskers poked out, backed up by a pair of cold, yellow eyes, peering out from beneath the brim of a black cap and displaying the expected twinkle of irreverence. "KoVaulk!" I chortled, recognizing the old wolftaur driver instantly. "What are you doing, driving this battery-operated buggy?" "Morph's got to do something for a living," he replied, "My tow truck route's taken tonight. We rotate our drivers and this is my week off. I'm used to driving in the dark, so I'm moonlighting as a cab driver," he explained, then his expression hardened a little bit as he cocked his head, sharp eyes narrowing beneath his black hat. "And, don't start howling at the moons, because all of us wolftaurs have already heard that joke!" "That's not what I mean," I assured him. "I know better than to give you any crap. What I mean is, I thought all of this city's taxicabs were fully automated." "Most of them are," KoVaulk corrected me. "Because there's such a dire shortage of cars and drivers, they'll convert almost anything into a taxi. Just as long as it's fully electric and can safely carry passengers, if it passes vehicle inspection, they'll take it. I'll bet that about thirty percent of the New New York taxis are morph-driven, right now." "I wish the one we called was morph-driven," I replied ruefully, stuffing my hands back into the pockets of my parachute pants and looking back behind me at the big building from whence I came. "It would probably have been here by now." "I was gonna ask you about the monkey suit," KoVaulk commented while pointing a finger out the window at my oversized lapels. "Oh, hell," I told him, turning back to face the cab so the wolftaur could see me roll my eyes, "we've been over at the Turner Coliseum, doing a big dog-and-pony-show for the visiting muckety-mucks!" "All of you?" KoVaulk asked. "Anybody who's remotely involved with The Project, and is also a Federation employee," I assured him. We had hired KoVaulk as a contractor, so he managed to avoid this evening's embarrassing affair by exclusion. "Everybody? Even Snowy?" KoVaulk asked with great expectation, looking around me at the tall building in the distance. "Vaulk," I reminded him about his chakat former lover, "shi isn't gonna go anywhere with you." "Hir loss," KoVaulk replied as he closed his eyes, tilted his head and shrugged, his ears laid back in regret-filled fashion. I just shook my own head in reply. Then, I studied the still-empty carport at the base of the Turner Coliseum. No taxi for us, yet. "On the other hand, I'll bet you've been waiting for that cab a long time, though, haven't you?" he followed up suggestively. "Rather than waiting for a genuine opportunity," I turned back toward KoVaulk and kidded him, grinning, "like certain members of the lupine persuasion consistently seem to be." "Now, now James," KoVaulk told me, inspecting the nails of his hands as if he'd just gotten a manicure, "I would never take advantage of Snowy, just because shi was in a compromising position. There yet remains something of a gentleman within this raggedy, old fur coat, you know. In any case, tonight, I wouldn't be able to act upon it." "No?" I questioned, rather confused. 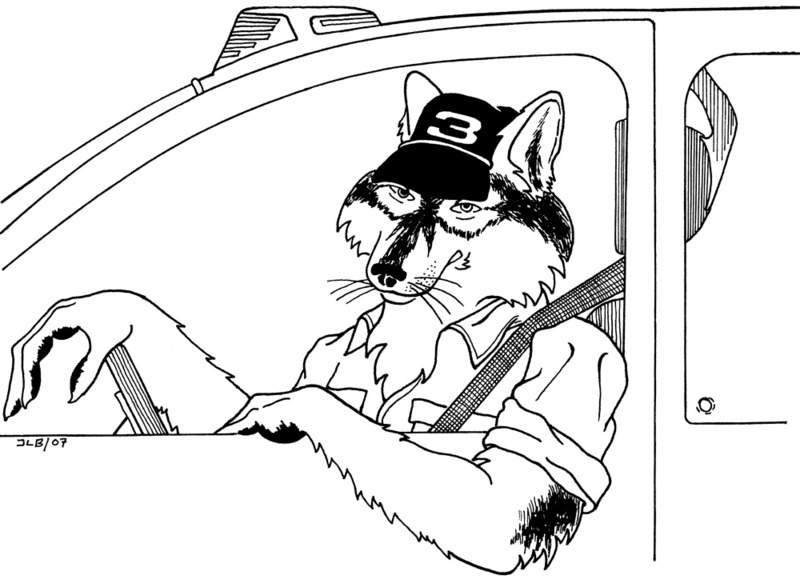 "This cab's taken," KoVaulk explained. "How's that?" I asked, requesting more information. "The meter's running. I'm waiting for Ricky. The street number is 718, a penthouse here on Shoreline Drive, right next to us," KoVaulk told me, quoting from a small note he was reading, held in one hand. I looked at the huge, multi-story apartment complex behind the cab and let out a low whistle. Indeed, it was an impressive domicile. "Very hoity-toity. Probably some big-bucks human business lobbyist here to wring more money out of the Chakonan government for some big city public works proposal," he scoffed, turning toward the complex. "If it's a rich human," I assured him, "then it's nobody I know." "And, I take the fare to Harwood Heights," KoVaulk explained as he studied his notepaper once again, reading by an overhead dome light. "That's quite an exclusive suburb, too," I observed. "I've only been here a short period of time, and even I know about Harwood Heights." "Well, it pays, James," KoVaulk replied in a sigh while he settled deeper into his taur seat chair back to wait a little while longer. I changed the subject, not quite then sure exactly what he meant. "Well, she's fashionably lean, and she's fashionably late,"
"She'll never wreck a scene, she'll never break a date,"
"And, she's no drag, just watch the way she walks,"
"She's a twenty-fourth century fox." – The Doors, slightly altered. We were probably talking for about five minutes. I didn't see my cab and KoVaulk didn't see his rider. Suddenly, we spotted movement in the vicinity. A dark shadow was seen coming toward us, from up the cobblestone driveway, still almost completely hidden under a dimly lit car port. "About time," KoVaulk grumbled, consulting his running fare meter. "Twenty-eight minutes already! Her client is a little slow." "Her client?" I queried cluelessly, looking back at the wolftaur. "It sure wouldn't take me," KoVaulk announced proudly, gesturing his left thumb toward his chest with certainty, "damn near half an hour to satisfy my lover!" I turned back toward the driveway, and there, emerging out from under the car port and into the street lights was Ricky. But, not really. Not the short name for Richard, not at all. Actually, her name was spelled Rikki. Rikki Venix. Yes, that was her legal name, folks. And, my gosh, did she ever look the part. As she strutted across the pavement and into the street lights, the bipedal, plantigrade, female red fox morph was sly enough to realise she had an all-male audience present at her taxi and decided not to come out of character. She flaunted that stride females assume when they intend to attract attention. A captivating side-to-side saunter seductively emphasized her more prominent physical attributes, which were further enhanced by an impetuous little shake, before swinging in the opposite direction with each carefully taken step. There are certain articles of clothing that are designed to intensify this performance by helping that style of movement along the way. Like any true professional, Rikki knew precisely what tools to use. She was clad in a black leather waistcoat, and one could only dream about what she wore underneath. The rather abbreviated coat revealed a curvaceous pair of thighs barely contained in tight, black fishnet stockings. A glossy pair of thigh-high black leather stiletto heel boots brought her long legs down to the asphalt, not only providing an accent to that stride I mentioned, but also raising the question in one's mind that goes, something like, hey beautiful, do those legs go all the way up to your... tail? Yeah, that's it! Her graceful, flowing tail, which was following her like a black tipped red sable artist’s brush, busily painting away at the image of one of the most incredible females we had ever seen. That, and an enormous cloud of coal black hair that surrounded her face and rolled down her back like an onyx, satin, hooded cape. Her tall, alert red ears and sparkling green eyes were pointed straight at us two spectators, fully aware of our undivided attention. Rikki waltzed around the front of the vehicle and headed for the side door. She sashayed on past me, and turning her head in my direction, she smiled broadly, apparently complimented and amused by my wide-eyed, astonished and obviously fully impressed expression. "Hi, sweetie," she teased, closing her eyes for that moment. I reached shakily back toward the taxi as KoVaulk popped the release for the automatic sliding passenger door, reflexively grabbing the handle and pulling the door the rest of the way open so that she could enter. It was a conditioned reflex. I guess that I have been well trained. I always get the door for the lady. Even when the lady is, well, not really a lady? Even when she's a prostitute. "Was it that kind of visit?" I asked Rikki plaintively. "Yup!" she replied brightly, still smiling as she climbed into the taxi and sat down. She crossed her legs, once again displaying proudly her ample pair of sleek, sumptuous, scarlet furred thighs blossoming out of those black pirate boots through those fascinating fishnet stockings. The winsome vixen cast me a provocative glance through half-closed eyes as she leaned forward to grab her seat belt, allowing me a glimpse into the great divide in an expansive bust line that distended the leather, strained the buttons and rose above the lapels of her coat. Her bright expression gradually changed into an intriguing, naughty grin, glistening with snow-white predatory teeth. I simply stood there, transfixed, still holding onto the door handle. "Thanks, honey," she breathed in a sultry voice, full of temptation. She was advertising herself for another customer, no doubt about it. I had to shut the door and hide that gorgeous pair of legs before I got myself into deep, deep trouble. I gently slid the door closed, carefully allowing her to whisk her tail inside the PTV after she settled herself, admiring one last time her shapely form as I did so. 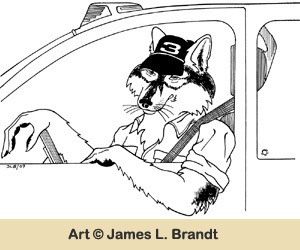 When I turned back toward the driver’s side window, KoVaulk was regarding me with a helpless gaze, out from underneath the brim of his trademark black cap. "One of her regular stops," he assured me. "Umm..." I began thoughtfully, rubbing my chin with one hand while I pointed toward the passenger's compartment behind him with the other, "Vaulk, have you ever..."
"What?! Are you kidding me?" he interrupted me. "On my salary? I could not afford such high quality carnal delights. Not hardly!" "Such a pity," I sighed, pursing my lips and nodding my head sadly. "Like I said, it pays," KoVaulk reminded me, flattening his ears. "And, what we do for a living doesn't," I admitted. "We might be accomplished," the wolftaur observed, "but we don't have her attributes and skill at what's certainly a high-risk profession." "Especially when dealing with humans," I added, a bit wide-eyed. KoVaulk merely nodded in reply. "Well, see you around, big guy," I said, waving him ahead. The power window rose up and closed. With a low-frequency squawk from its electric motor propelled CVT belt, the PTV chirped its tires and drove off toward the suburbs. I stared after it, lost in abject, salacious fantasy for a moment, then shook my head and turned away. I stuffed my hands into my oversized pockets and ambled back to the Turner Coliseum parking lot, baggy pant legs flapping like elephant ears on a blustery day. As I reached the driveway, a stubby, white PeeTee zipped past me from the street and came to a stop just ahead of me, next to the main door under the carport. It had to be ours. No way was a taur going to fit into that thing. As I drew nearer to the little self-propelled cubicle on wheels, its motion proximity sensors detected me, and it started talking. "Courtesy Coach cab here for mister and misses Brandt!" a cheerful recorded voice called out to me from inside the fully robotic cab. "Courtesy Coach is your first choice for prompt, reliable service!" "Better check your wristwatch, motherboard-brain," I grated with deep sarcasm as I walked up to the parked PeeTee. "Oh, wait! That's right! You don't even have a wrist, now do you? Silly me." "Courtesy Coach cab here for mister and misses Brandt!" the cheery voice repeated, totally oblivious to my frustration. "Alright, alright, I'll have your party here in a moment," I growled, swiping my card in the outside reader slot next to the passenger door of the cab. I then turned and pushed open the door of the building while I called back to the cybernetic chauffer. "I'm wasting my time complaining about how dense you are, right?" "Courtesy Coach cab here for mister and misses Brandt!" it replied. I found the entire incident difficult to relate to my wife. "James, it would be just like you to walk in on a lady of the evening right after she finished with her patron," she told me, laughing, as we walked out of the main doors of the Turner Coliseum and toward our taxi. "Like, you're the footman for her coach, or something." "Yeah, I guess," I conceded as I held open the door of the taxi for her to climb in, then swung inside and sat down, closing it after me. "I keep hoping that old KoVaulk will at least pick up a nice tip, or something." My wife groaned loudly, then told the taxi cab voice recognition unit the address for our destination, the Oceanline Beach Aquila Hotel. "Geez, I was thinking more along the lines of an address over there in Harwood Heights," I admitted, thumbing my moustache deliberately. That's when I got swatted. Postscript: This story really happened. Only the universe has been changed to protect the guilty. I just had to relate it to somebody, spinning this little misadventure off of that long, involved epic masterwork we amateur writers are always trying to finish. Please see "Midnight Rescue" for more background.